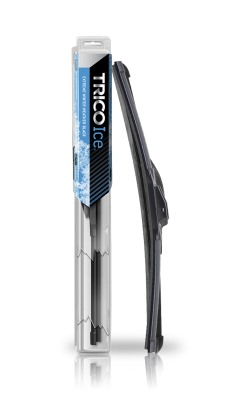 The TRICO Ice® Winter Wiper Blade is used to reduce snow and ice build-up on your car’s windshield. Its Memory Curve steel beam combined with a Teflon surface protector on rubber provides uniform pressure for a clean, clear, smooth and quiet wipe in any temperature. This windshield wiper blade also features a rugged, synthetic-blended armor that is infinitely flexible, yet protects critical components from ice and snow in harsh winter driving environments. It is durable in any weather and has been tested to perform over 1.5 million cycles. The TRICO ice wiper blade is easy to install and fits 9mm hook, 9×4 hook, side lock, side pin, pinch tab and push button arm styles. Thanks to SWIFT Easy Connection Technology, it is also quick to replace. 35-260 - TRICO Ice® Wiper Blades 26" 35-190 - TRICO Ice® Wiper Blades 19"